Since he loves the outdoor playhouse we scored for him on Craigslist last month, we decided to build him something fun for indoor play. 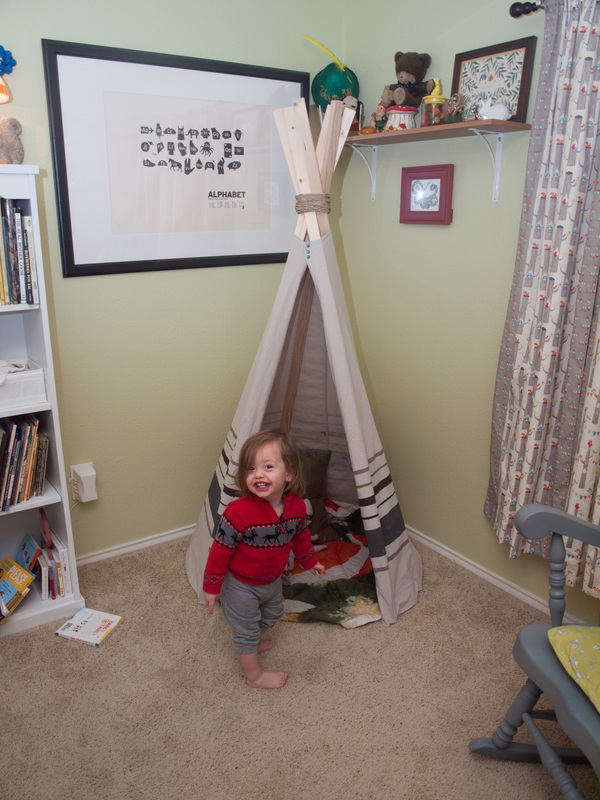 I scoured Pinterest and my heart was stolen by the idea of a tiny teepee (tipi, tipee) for the corner of his bedroom. 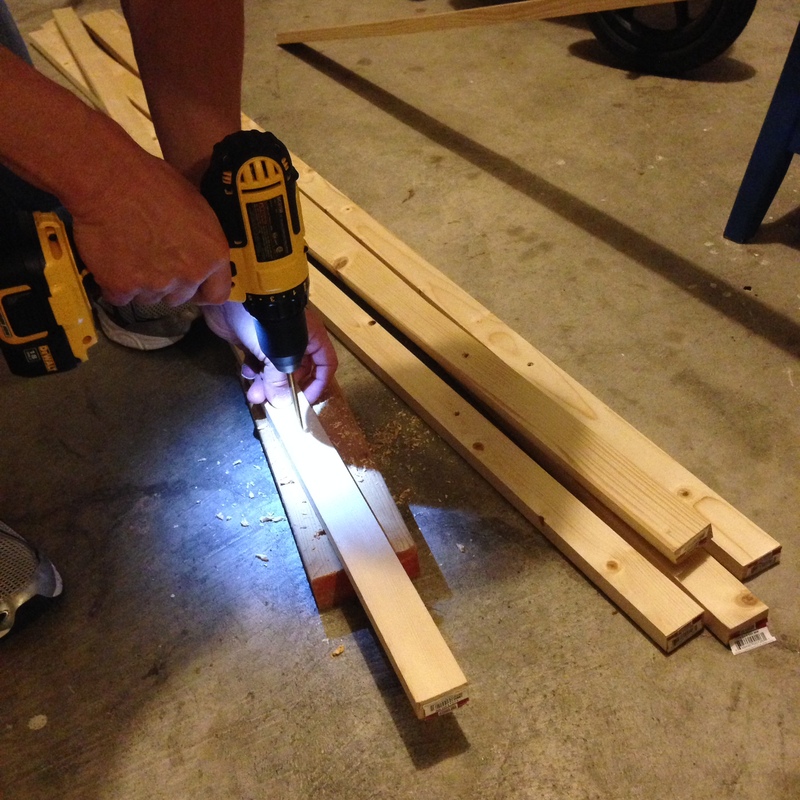 We Frankensteined a few tutorials – picking our favorite elements from each. These two were the main inspirations. 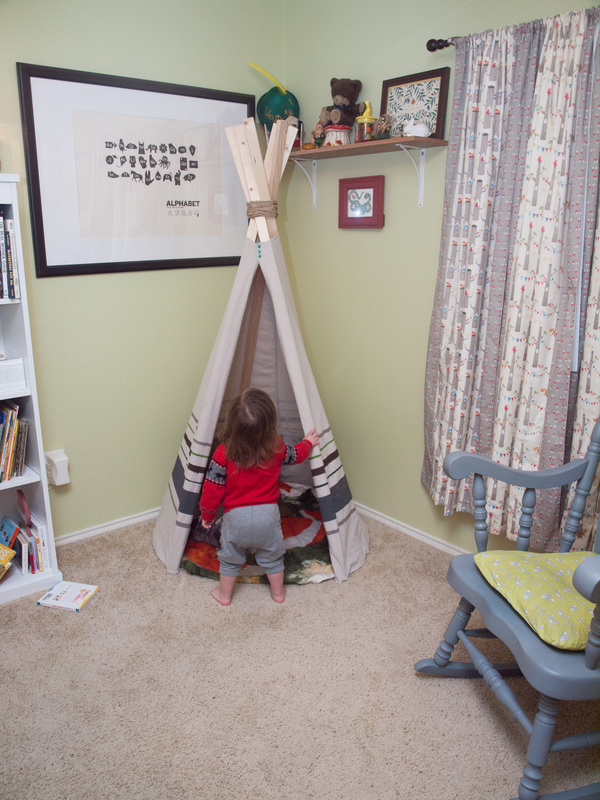 (Take a hop over to Pinterest and do a search for teepee. The variety is unbelievable.) 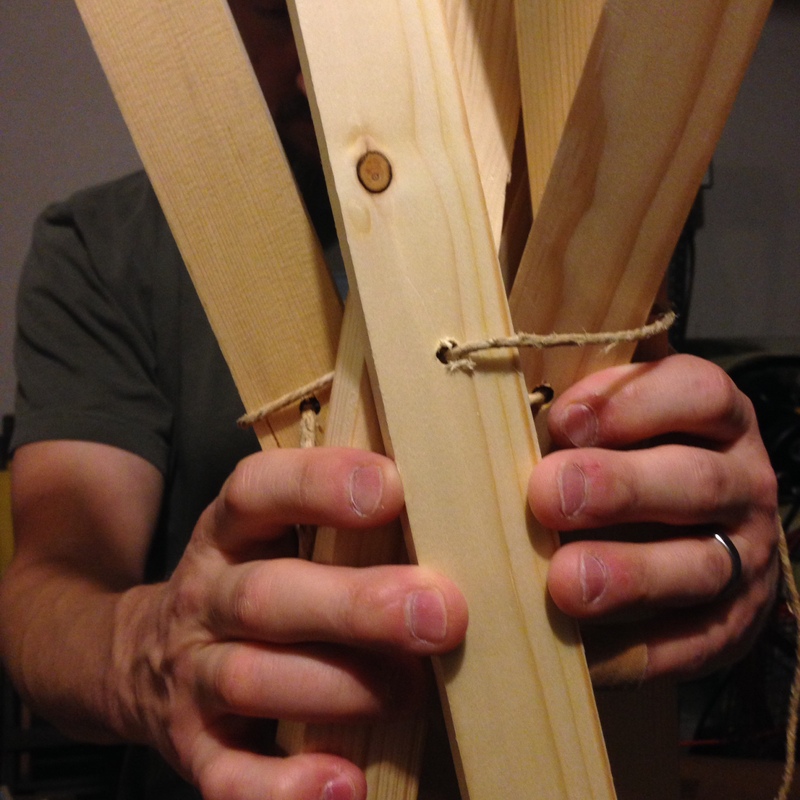 Ultimately, we decided to use 1″x2″x6′ boards (6 of ’em) and hemp twine for the frame and a canvas drop cloth for the cover. 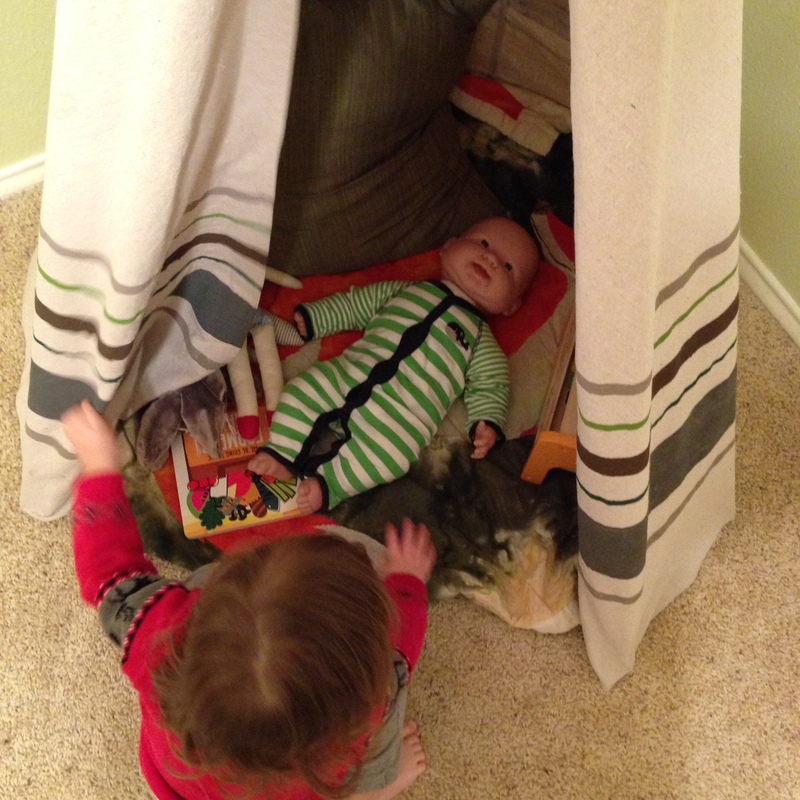 We were worried about making it too big for his little bedroom… but, in the end, it actually came out a teensy bit smaller than we had been trying for. But still adorable! What follows is not so much a tutorial as a general outline of how we winged it. 😉 Feel free to ask me questions about specific parts and I’ll do my best to fill in the gaps if you’re venturing on this same project. 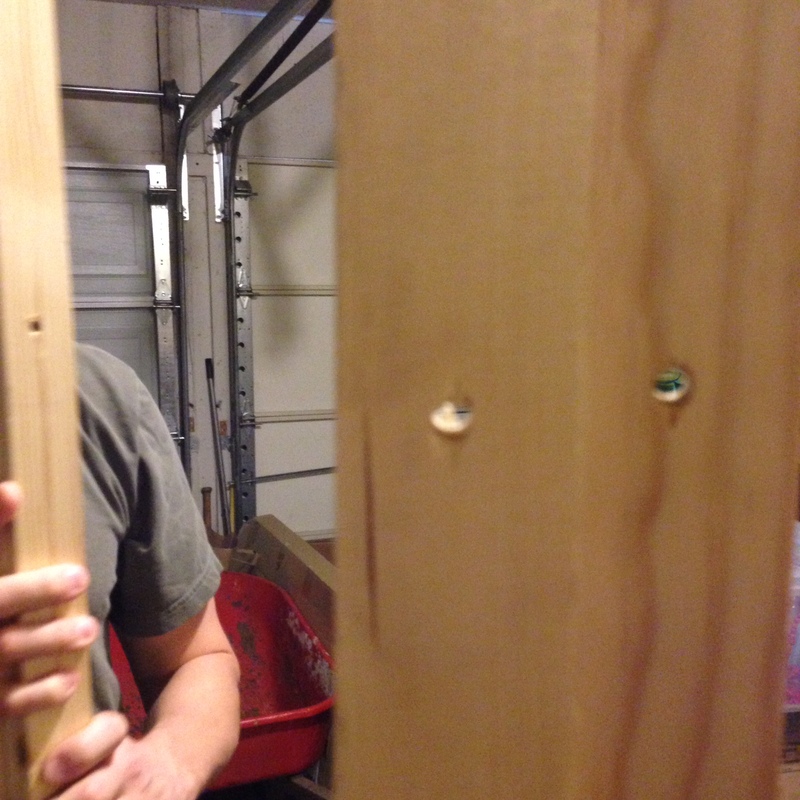 So, we took our six 6 foot long 1x2s and drilled a hole in each about one foot from the top. 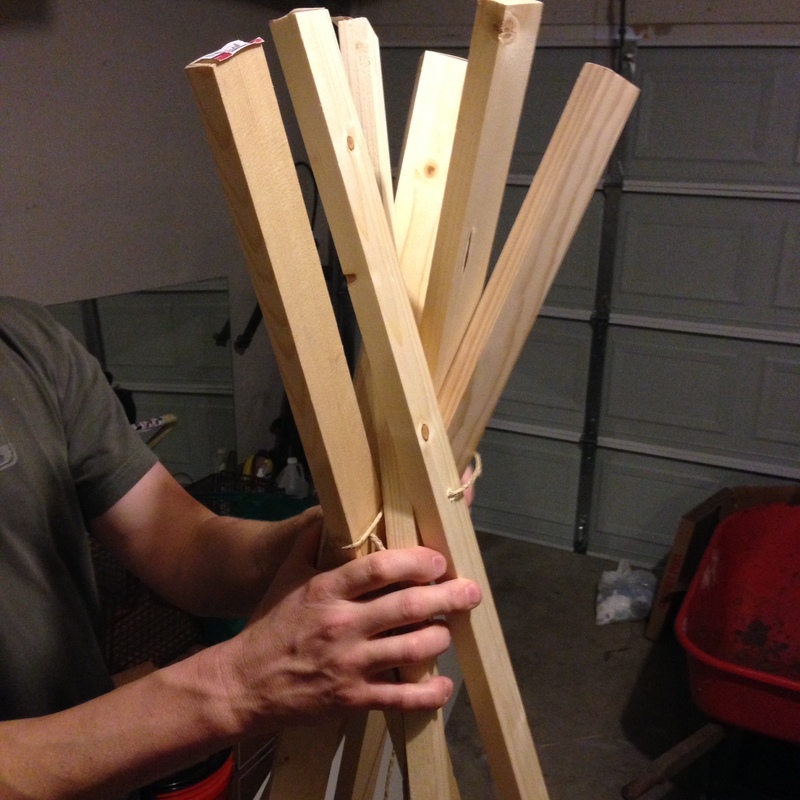 Then we arranged our poles as best we could, threading the twine through the hole of each one as we went. This would have been impossible alone – thank goodness for an extra set of hands! This whole part is a good example of how there was no real plan… just a vision. And a patient husband. Once we had the poles arranged in a manner that looked like it would make a frame capable of standing on its own, we wrapped the twine around and around and around. We tried to make it nice and tight – but, there was still a bit of give for us to rearrange those poles. That turned out to be a blessing. We struggled for a bit to wiggle the frame to a position where all the legs were even. We knew we were shooting for a round shape, but how do you eyeball that? Luckily, my hula hoop made the perfect cheat sheet! We used it as our guide and things got a lot easier. A little tailor’s chalk marked my hem line. I also marked where each leg was. 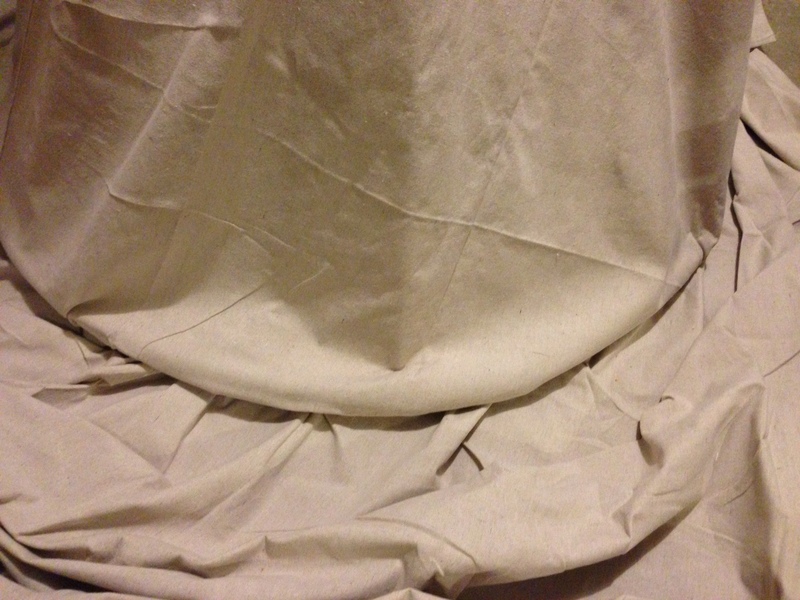 When sewing, I left a gap in the hem at each of those marks, creating a pocket for each leg to fit inside. **Not pictured: I trimmed up the edges and whisked the whole thing away to my sewing machine where I sewed a bottom hem, (leaving gaps in the hem where I had marked for the legs) as well as hemming the top edge and front doors. Blank canvas! Not for long. I decided to spruce the cover up with a few earthy stripes. Enter some painters tape and my kitchen floor. And my cross eyed assistant. I added some snaps to the top of the door to keep it firmly attached to the frame and we were in business! 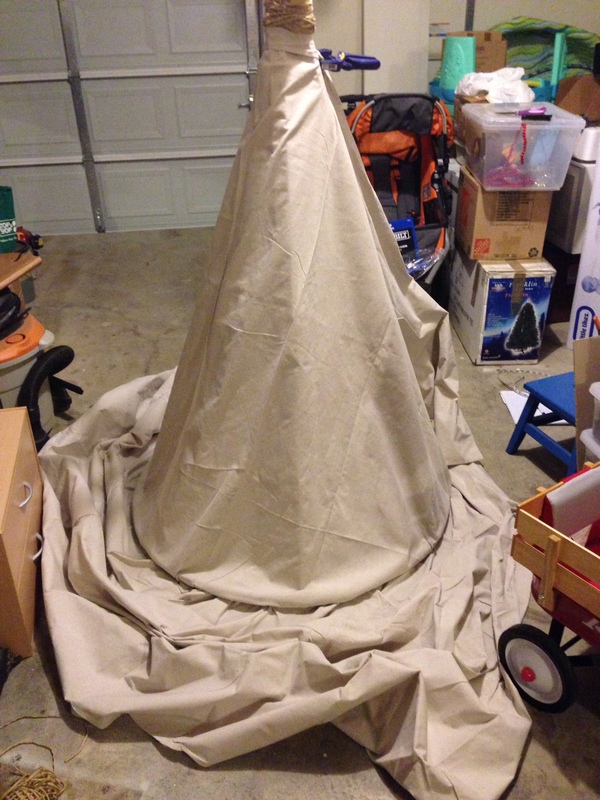 Since we were going to be traveling for Christmas, we decided to do the unveil a few days before we left. I’d say it was a hit. 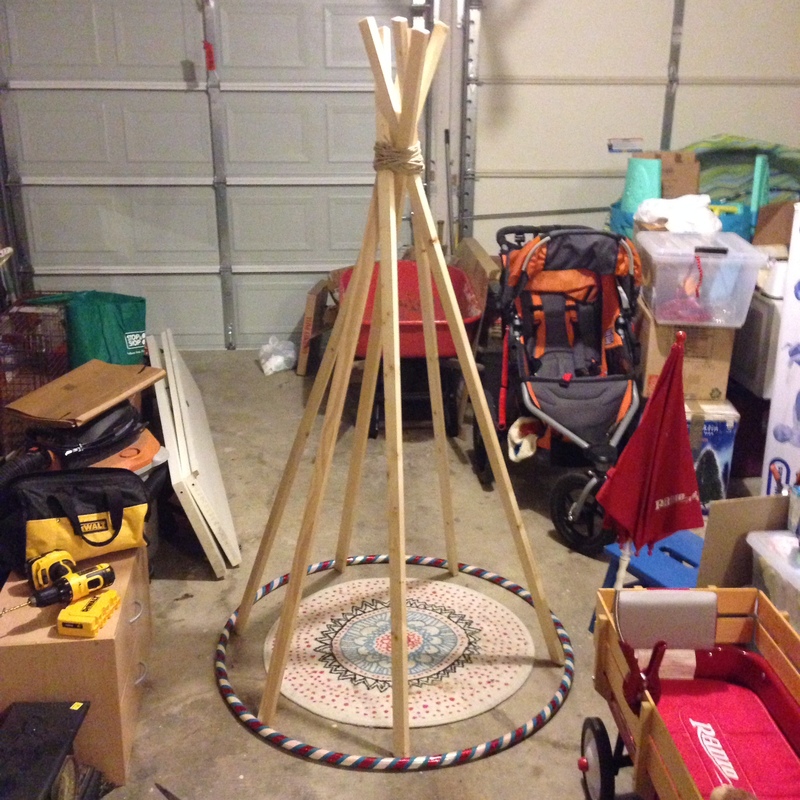 Fox’s teepee is now THE place to be. 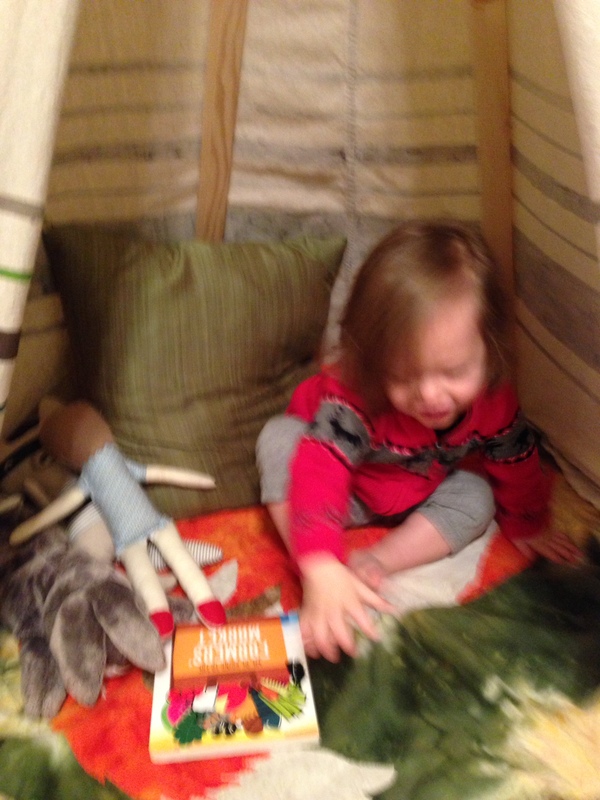 Any little fabric person or stuffed animal who is anyone has been to story time at this new hot spot. Despite our age (and size) the owner is gracious enough to let SteveKam and I come in to hang out with the beautiful people from time to time.